The LTC has a 4.25-inch barrel, matching short slide and aluminum frame. It weighs 28 ounces, compared to the all-steel, full size 1911 at 39 ounces. A Colt Commander weighs 26 ounces. The additional two ounces are due to the LTC's full-length guide rod. The LTC has nice fixed sights with tritium inserts. And since the sights are dovetailed into the rounded top of the slide, they're windage adjustable. The rear sight is a new Para USA design. It's squared off up front so that one-handed slide manipulation is made easier; you can catch this abrupt edge on a belt or boot. Six diagonal grasping grooves are at the rear of the slide. The Para USA tactical rear sight has an abrupt front face that allows the shooter to manipulate the slide by catching the face on a belt, table or similar object. Inside the slide, along with part of the Colt-based Series 80 passive firing pin system, is the Para Power Extractor, which I see as a definite improvement over the original design. The Power Extractor articulates, with its front half pushed inward under spring-driven pressure. This keeps the extractor hook under a constant inward force to positively capture the cartridge case rim. Another Para USA factory-supplied custom feature is the fully supported and ramped barrel with the feed ramp extending down into the frame. This elongation almost guarantees positive feeding and, I think, surely adds to this sample's reliability in 9mm. Operating controls are all where they should be. The single-sided thumb safety has an enlarged and grooved ledge for more positive operation. The standard-configuration slide stop is grooved. The magazine catch is checkered, as is the flat mainspring housing. The frontstrap is unadorned. The magazine well has a slight bevel, and the well-shaped beavertail grip safety rises up far enough to surround the lower part of the skeletonized and rounded hammer. The polymer trigger is of the "long" style, also skeletonized, and has a trigger overtravel screw accessible through the grooved trigger face. At first, the trigger pull weight was six pounds, but after my extensive shooting of the LTC, it now breaks at a smooth 5.5 pounds. The LTC uses a full-length guide rod, as mentioned earlier, giving the LTC a slightly muzzle-heavy feel. A 12-pound recoil spring is used in conjunction with a 16-pound mainspring. (Colt specifications, in contrast, call for a 14-pound recoil spring and 23-pound mainspring.) Attractive checkered-wood grip panels complete the picture. It's a nice gun to shoot and to carry, as I reluctantly discovered--"reluctantly" because I've never been a fan of the genre of shorter and lighter 1911s. I've not found any that will tolerate neglect or, putting this another way, they all require paying fairly strict attention to a scheduled replacement of recoil and magazine springs, for these small guns work only if these parts are at full strength. The LTC has a skel­e­tonized hammer, ample beavertail grip safety and extended thumb safety. Now, with all this bias in mind, I set out to give the Para USA LTC as fair a test as I could. My notion of fair was to sort of sneak up on it. I began by digging out a lightweight Colt Commander in .45 ACP customized by Joe Venezia. After initial inspection and lubrication, I took the LTC, the .45 Commander and a full-size 9mm Colt 1911 to the range. 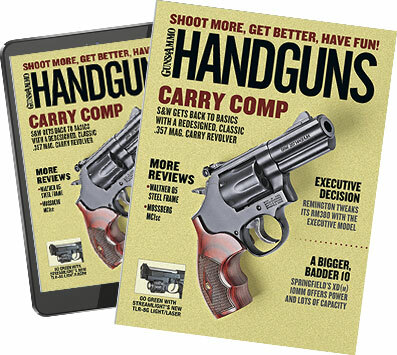 I first shot the .45 Colt Commander using Black Hills 230-grain ball and remembered one reason I like a full-size 1911 over the lightweight: the heavier gun is just easier to shoot quickly. Next came the full-size 9mm Colt, firing Remington UMC 115-grain JRN. This was almost like shooting a .22 conversion unit on a 1911--almost no muzzle lift or felt recoil. The LTC's barrel is fully supported and ramped. Its barrel hood is notched, which serves as a loaded-chamber indicator. I then moved over to the LTC with the Remington 115-grain JRN, followed by Black Hills 115-grain JHP and Hornady 124-grain XTP. All were still pleasant to shoot. I then fired up a magazine of Winchester +P+ 127-grain Ranger--definitely a serious load with more snap in felt recoil but still very controllable. I then fired a full magazine plus one of Hornady 124-grain XTP, then Black Hills 115-grain JHP, followed by Corbon 115-grain +P JHP; all worked without malfunction. I switched between the two supplied nine-round Para magazines and two of the new 10-round Wilson Combat magazines and had no malfunctions. I then did some draw-and-fire work with magazine changes at 10 and 15 yards--again, no problems. On the next outing, I used the outdoor range for chronographing and accuracy work. I also created one more test. I toss leftover and loose ammo in a coffee can and burn these up in practice. I sorted through these, finding a good assortment of 9mm with various bullet shapes and brands, which included Norma, PMC, Corbon DPX, Winchester Talon, military WCC head-stamped "88"and some otherwise-unidentified jacketed reloads. I loaded two full magazines and one partial, alternating as best I could each bullet type and brand of cartridge. I then shot the three mags at a count of one round every second or so. Again, no malfunctions. For me, this was an outstanding performance. But (and there's always a but) after I finished the above duties, I found one circa 1980 Colt magazine in a corner of my 9mm ammo bag, and it was loaded with Remington 115-grain JRN ammo. For no good reason, I loaded up and ran the LTC as fast as I could fire and, no surprise here, I had one round squirt out of the magazine where it was caught by the slide. The old magazine's spring is noticeably weaker than the others. I guess, then, the LTC can only be said to be 99 percent reliable. Well, I'll take that. The point of all this is I'm now confident saying the Para LTC can be used for self-defense. Plus, it's more inexpensive and easier to shoot, what with 9mm ammo costing less than .45 and with much less felt recoil. The LTC certainly fits my requirements for fun, sport and self defense.